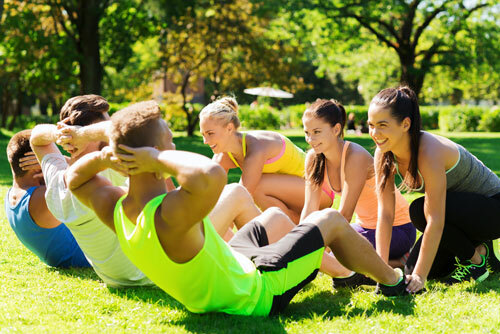 On Friday, June 3, UNB Fredericton Recreation Services (URec) will hold an outdoor bootcamp on the green field in front of the Richard J. CURRIE CENTER. The Sweat for a Cause bootcamp will take place from 12:10 p.m. – 1 p.m. All members of the UNB and Fredericton community are invited to participate. No membership is required; admission is by donation. From 11:30 a.m. – 1 p.m. there will be gently used URec fitness equipment for sale such as yoga mats and dumbbells. All proceeds from the bootcamp and yard sale will be donated to MCAF in support of the Syrian families settling in our community. “This event is reflective of the efforts UNB and URec are making to be active contributors to the UNB and greater Fredericton communities, much like our Cyclethon in support of the Heart & Stroke Foundation of New Brunswick and the ‘Biggest Zumba Class Ever’ fundraiser for our QEII scholars,” said Alina Cress, URec program co-ordinator. URec instructor and international PhD student in mechanical engineering at UNB, Mahdi Hosseinali, will teach the bootcamp. Mr. Hosseinali will offer variations of every move for attendees, making the class suitable for all fitness levels. The University of New Brunswick is eager to do our part to help Syrian newcomers settle into our community. UNB is currently working with the Multicultural Association of Fredericton (MCAF) and other community groups on a coordinated effort.